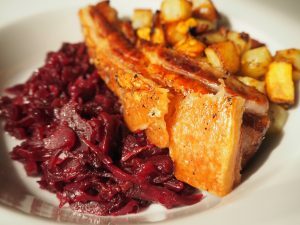 Crispy crackling and soft roasted pork belly, this naturally gluten free recipe is a winner paired with braised red cabbage. 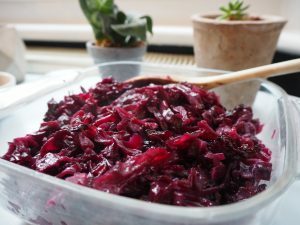 My mum’s red cabbage recipe is amazing (and gluten free of course) and no other red cabbage tastes as good to me. Slow-cooked with redcurrant jelly, apple and other tasty seasonings, it is perfect for elevating standard roasts into something special. 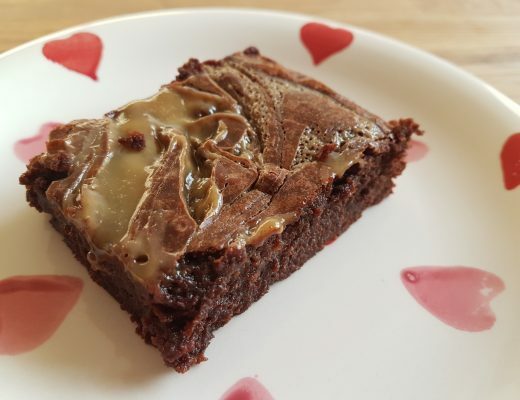 So here we have a 2-in-1 recipe for you! 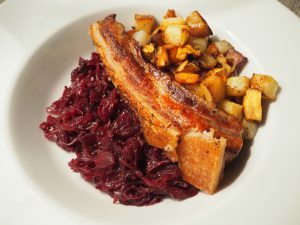 Make the red cabbage as a stand alone, amazing side dish, or serve it with slow roast pork belly and cubed potatoes. The sweetness of the apple and redcurrant in the cabbage pair perfectly with the slow roast pork. 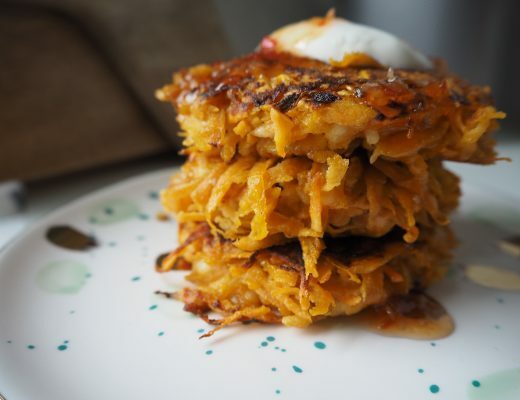 It’s a perfect dish for entertaining as it requires minimal effort if you make the cabbage in advance. 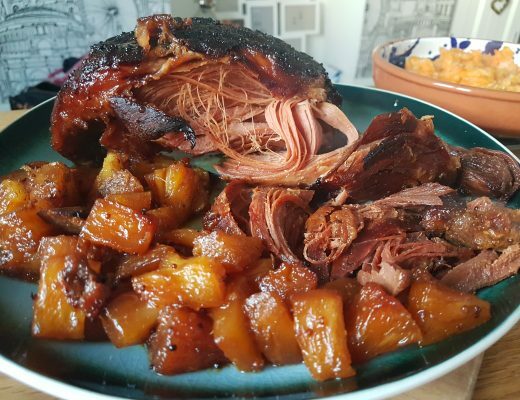 I’ll be making this gluten free roast in the days after Christmas for easy dinners. Find the full recipes detailed below, with the red cabbage first then pork belly recipe below. I prefer to make the red cabbage in advance as then the flavours develop fantastically. You can even make it the day before if you really want to save yourself some time for this quick gluten free roast. Oh and a quick pudding suggestion for afters – try my gluten free lemon meringue yule log as a showstopper dessert to follow! 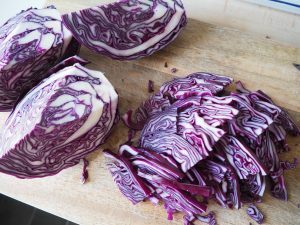 Chop the stalk end off the red cabbage and cut the cabbage head into quarters. 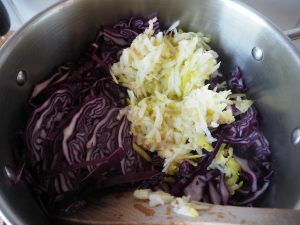 Then finely slice the cabbage and place into a heavy-bottomed casserole dish. Coarsely grate the flesh of the cooking apple straight into the casserole dish. 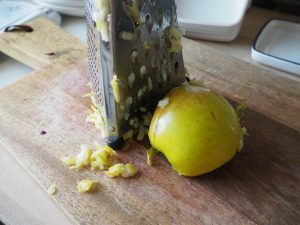 No need to peel the apple, as the skin can just ben grated too. You simply discard the core. Now, add all the remaining ingredients to the casserole dish (the butter, sugar, salt, cider vinegar, redcurrant jelly and water). Fire up the hob and cook the cabbage over a medium heat for 15 minutes, stirring frequently to ensure all the ingredients are well-combined. Then turn the heat down to low and cook for a further 45 minutes hour, covered with lid and stirring regularly to ensure it does not burn or stick on the bottom. You can either serve straight away or set aside and reheat later when you are ready to eat. Prepare the joint by laying it out flat. 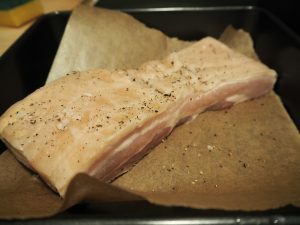 Then score the skin (as preparation for the crackling) and pat dry with kitchen towel. Then rub sea salt and black pepper into skin (no oil needed). Roast at 220C (fan) for 30 minutes. The skin will start to crisp up nicely into crackling. 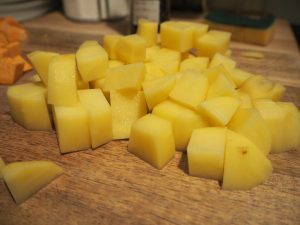 While the pork is roasting, peel and chop the potatoes and sweet potatoes into small cubes. Then turn the oven down to 160C. 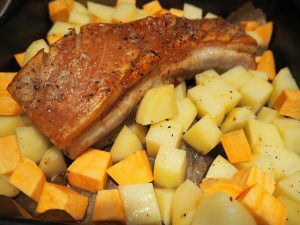 Take the pork out and add the cubed potatoes and sweet potatoes to the tray. 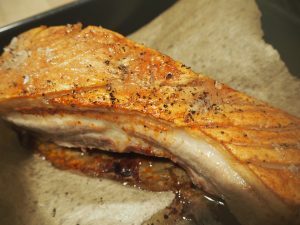 No need to add oil as the fat from the pork belly will crisp them nicely. Now roast at 160C for 1.5 hours, turning the potatoes midway through. Then remove from the oven and serve up to your guests. 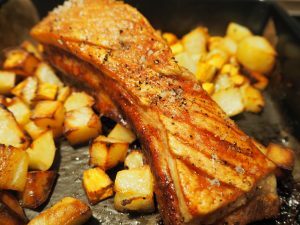 Slice the pork belly into long chunky strips, then place on a bed of braised red cabbage with crispy potatoes piled around the sides. Delicious!